Chirostenotes was a dinosaur that lived in North America (its fossils have been found in Alberta, Canada) during the late Cretaceous period, about 80 million years ago. Chirostenotes was about 9½ feet (2.9 meters) long, about 3 feet (0.9 meters) tall at its hips, and around 110 pounds (50 kilograms). Chirostenotes had a toothless beak, long arms with powerful claws, long slender toes, and a tall rounded crest similar to that of the modern cassowary bird. Chirostenotes is thought to have been an omnivore and would probably have eaten small animals, eggs, insects, and some plant material. North American Dinosaurs - Chirostenotes lived in North America. Chirostenotes was a genus of dinosaur. Chirostenotes was a member of the Saurischia ("lizard-hipped") order of dinosaurs. What this means, is that although Chirostenotes was not closely related to lizards, it did have similarly shaped pelvic bones. 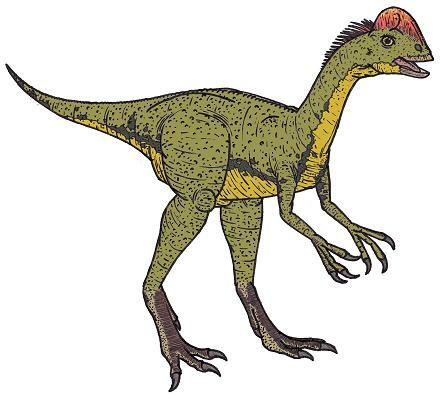 Chirostenotes was a Theropod - a member of a group of related bipedal dinosaurs that included the ancestors of birds (although Chirostenotes was not itself an ancestor of birds). Chirostenotes lived about 80 million years ago, during the late Cretaceous period. Chirostenotes was a omnivore (ate both meat and plants). Chirostenotes is thought to have small reptiles and mammals, insects, eggs, and plants. Chirostenotes was about 9½ (2.9 meters) long, and about 3 feet (0.9 meters) tall. Chirostenotes weighed about 110 pounds (50 kilograms).